Cigar Girl is an assassin working for Renard, and is operating undercover at the Swiss bank that James Bond 007 pops into in search for information on the killers of a fellow agent. When the banker, Mr Lachaise, is about to reveal information, Cigar Girl expertly terminates him with a well places throwing knife, and flees the building. "Would you like to check my figures?" The closest 007 ever gets to enjoying Cigar Girl's assets is when she leans over with Sir Robert King's receipt, revealing her perfectly rounded figures. In a scene cut from the movie, Cigar Girl and Renard look through an apartment window opposite the bankers office and snipe the goon who has a gun pointing at 007, ensuring Bond gets out alive to unsuspectingly deliver the bomb to MI6 HQ. With Sir Robert King dead and a gaping hole left in the side if MI6 HQ, Cigar Girl's final mission is to dispose of the delivery boy - 007. Positioned on the Thames river in a Sunseeker jet, Cigar Girl had Bond in her sights, but 007 avoided the fire and set about chasing her along the Thames in the (unfinished) Q Boat. An expert with a speedboat, Cigar Girl evaded capture from James Bond in his faster and more manoeuvrable Q-Boat, and made her escape in a hot air balloon. Unfortunately for her, MI6 helicopters were fast on the scene, and 007 managed to catch on to a tether rope as she took off. With no escape route left, and after turning down Bond's offer of protection, Cigar Girl shot the gas tanks on the hot air balloon and blew herself up. Born in Messina, Italy, Maria Grazia Cucinotta moved to Milan to study and took up modelling at the age of 16. She soon tired of being used simply as an image, wanting to be recognised for her mind as well as her face and, after finishing her studies, moved to Rome. She got her big break when Renzo Arbore signed her to appear in the TV show Behind All. Cucinotta has continued her studies and taken diction lessons to eliminate her Sicilian accent. In spite of her success on television, she signed with a movie agent and, after numerous failed screentests, was spotted by Massimo Troisi and signed to play the beautiful Beatrice in Il Postino. The huge success of the film meant that she began to be recognised as an international movie star and the offers flooded in. She made several more Italian films (including I Laureati and Il Sindaco) before her Hollywood debut in A Brooklyn State of Mind. 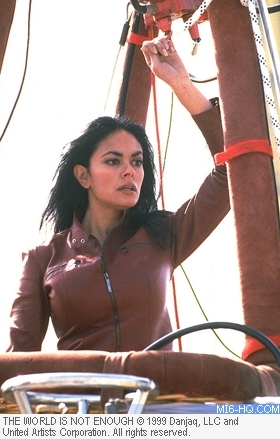 Sharon Stone was originally targeted by MGM to play Elektra King in 'The World Is Not Enough', the same role that Cucinotta originally screen tested for, and would co-star a year later in "Picking Up the Pieces". As her English was not up to the level required for the part, Cucinotta was offered the role of the Cigar Girl, but she still left a big impression with audiences despite her smaller part. In 2000 she was cast in the Timothy Hutton comedy "Just One Night", and made a guest appearance in an episode of "The Sopranos". Since 2001 she has appeared in several TV shows and feature films in her home country Italy, where she is extremely famous. Maria has been married to businessman Giulio Violati since October 1995. They live in Rome and she does everything in her power to make sure tabloid reporters don't invade their privacy.